Last weekend we took a trip to Hermanus to do some whale spotting and hopefully get a few photographs. On our previous trip we used a very basic Fuji digital camera with a 3 times optical zoom. This time we hoped to get more interesting pictures using the Canon S3IS with 12 times optical zoom. The weather was sunny but with a cold blustery southeast wind and the sea was quite rough. The whales were out in force in the bay but were not all that cooperative as models. We took a few pictures from the cliffs near the old fishing harbour before dropping in to one of our favourite seafood restaurants, Bientang's Cave, for lunch. While enjoying a delicious meal with a well-chilled bottle of Boschendal Sauvignon Blanc we were able to continue watching these magnificent creatures frolicking in the waves below. 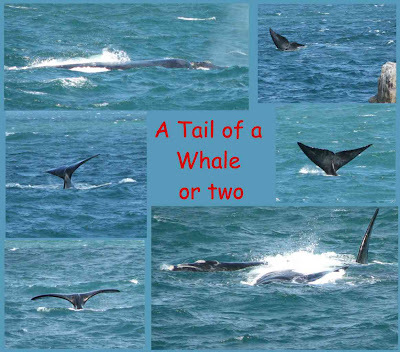 The photographs were a little disappointing as the whales seemed determined to display little but dancing tails but, what better way is there to spend a Sunday afternoon?